Half up half down hairstyles are very stylish and popular. 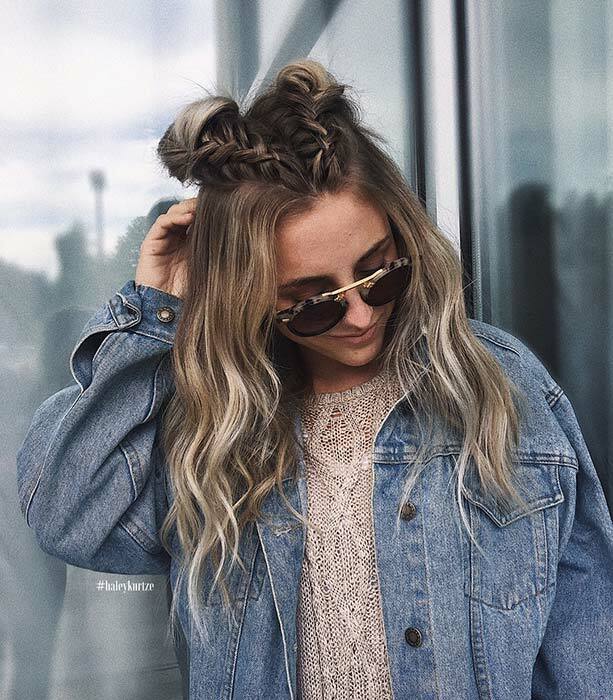 There are so many ways to wear this look and one trendy version you should try is half up half down braids. 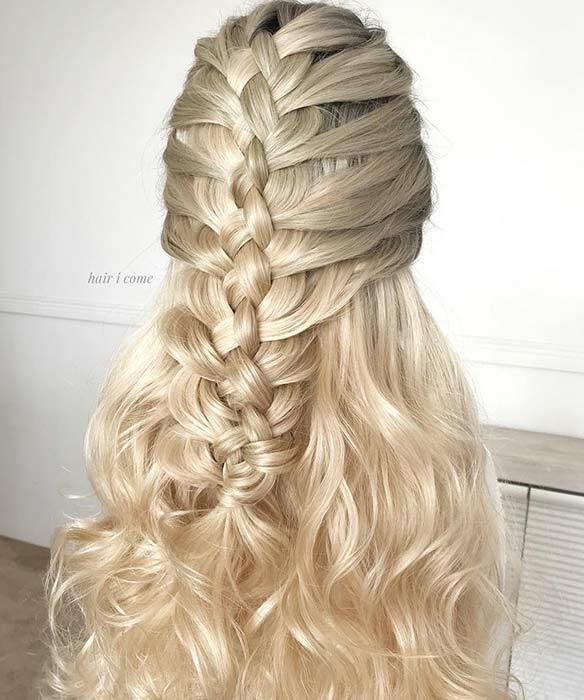 Braids will really jazz up your hair and there are different types of braids that you can use to create a beautiful and unique hairstyle. 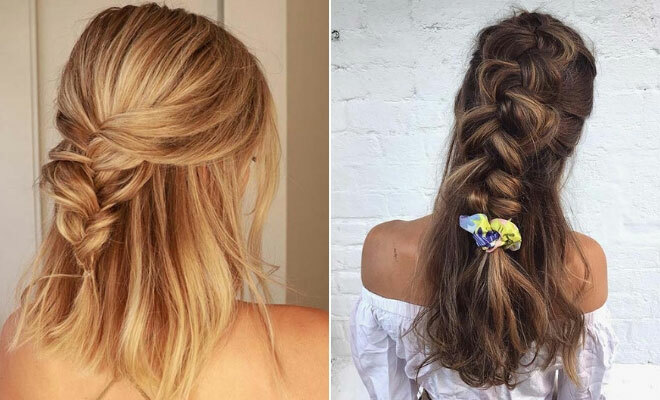 To show you how amazing these hairstyles can be, we have put together 21 gorgeous half up, half down braid ideas. There is something for everyone, and there are braids to suit different hair lengths too. First up we have this cute braided hairstyle. The hair has been styled into four large Dutch braids which creates the half up half down look. All four braids meet in the middle and have been tied together with a scrunchie. We love the scrunchie because it is trendy and unique. You can recreate this look or use two braids instead of four, you can also use a hair tie of your choice too. It does not have to be a scrunchie. A popular braid you can try is a fishtail braid. Here is a stunning way to wear a fishtail braid with the half up half down style. The hair has been split and the upper section has been styled into a sleek braid. It is a pretty and stylish look that will suit everyone. You can wear a braided hairstyle like this for any occasion. 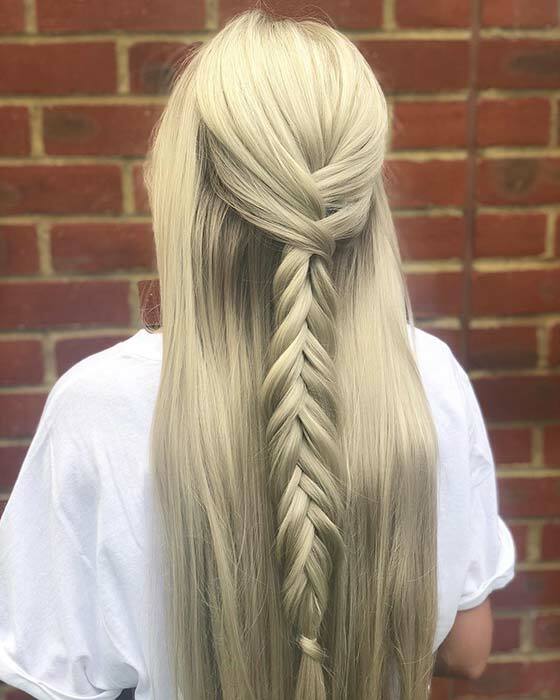 There are lots of tutorials and videos online to show how to create a beautiful fishtail braid just like this. Next, we have another braided look that features fishtail braids. This one has two braids that meet in the center. It is a stunning braided hairstyle that has a boho vibe. You can recreate this style or you can use the classic three strand braid instead. It is a versatile hair idea that can be worn anywhere from a casual day shopping to a special occasion like a wedding. If you want a braided hairstyle that will wow, then this is for you. For this look, the hair has been split into half up half down sections. The upper half of the hair has been styled into a five strand braid. Five strand braids can be a little complicated but there are lots of tutorials available online. We love this gorgeous hairstyle, it is one of favorites. When creating a braided half up half down style, you don’t have to stick to one braid type. 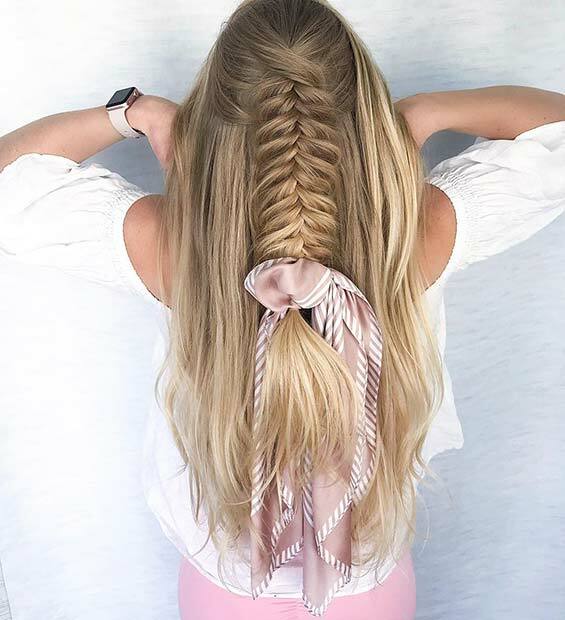 You can use two or three different braids to create a unique and trendy look. Here is a gorgeous example. The hair is split and the upper half has fishtail braids with loose sides. 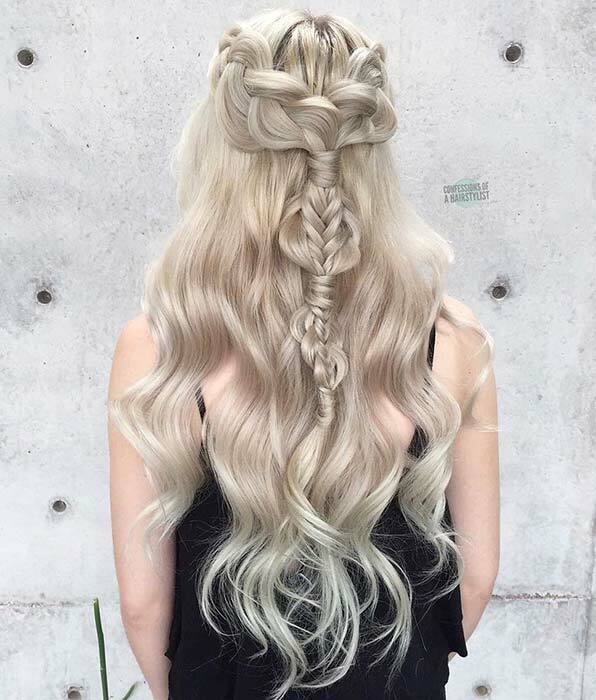 On the lower half of the hair, there are two three strand braids too. It is a cool and textured hairstyle that has a boho vibe. Recreate this or try different braids of your choice. If you have shorter hair, this is a braided style for you! For this style, the hair is cut to a length that sits just below the shoulders. Then a half up half down style has been created with a loose fishtail braid. It is stylish look that will suit everyone, it can be recreated on even shorter hair too. The next hairstyle we have to show you is bold and statement making. 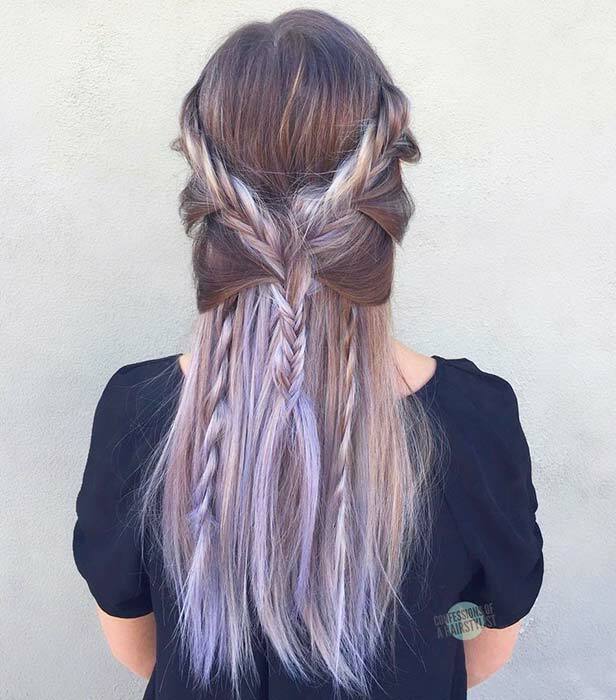 This hair idea features three braids that are styled across the hair. The rest of the hair is loose and curly. We love the three braid design as it is an unusual version of the half up, half down style. 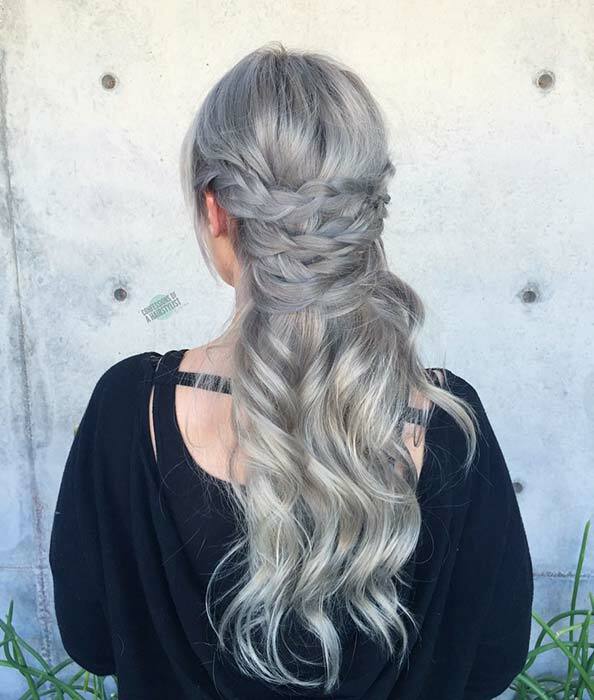 Wear a similar hairstyle with your own hair color or go all in and recreate the grey hair color. Jazz up your braids by adding accessories. Here is a beautiful example. The hair has been split into sections with a gorgeous single braid going down the center of the hair. This look has been finished off with a super stylish scarf. The scarf looks so trendy and it will make your hair unique too. Any small scarf can be used with any pattern and in any color. 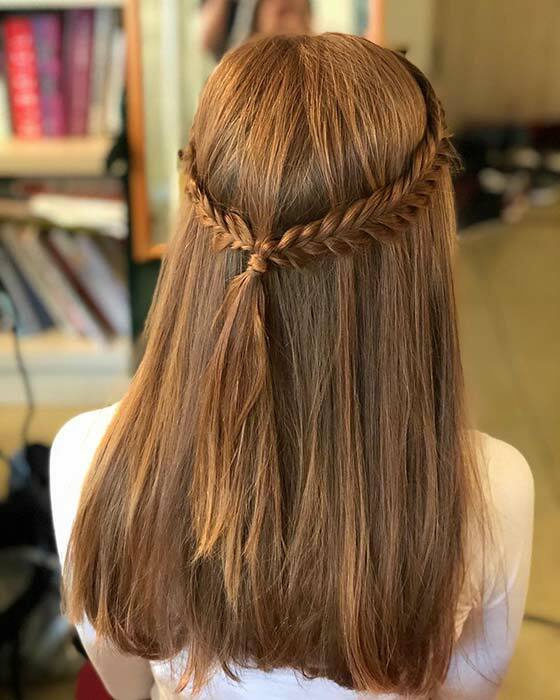 Next, we have another unique hairstyle that uses different braid types. For this look, the hair has been split and styled into two three strand braids. Then once the braids meet, they both are blended and turned into a fishtail braid. There are also small wrap arounds that create sections too. It is a statement making hairstyle that will look stunning for any occasion. This kind of hairstyle is best suited to longer hair. A cute hairstyle that many people love is a half up, half down style with a bun. This next hairstyle is a stylish and cool version! The hair is split into the half section and is styled into two braids that turn into two buns. We love this because it is a different take on the hairstyle and it brings two hair trends together.